A total and complete waste of time. ...A lame screen saver plus dragons. In a fantasy world where high technology has given way to quaint villages and fanciful airships, three good friends wander the land, hunting for their living. One day, out of nowhere, a black dragon appears, slaying one of the three and capturing the second, leaving only our hero, Kyle. 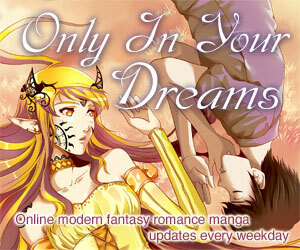 But the dragon has an enemy, a blue dragon in need of a new rider, and Kyle is quick to oblige. The two form an uneasy alliance and set off over the vast land, in a race to a huge tower that, should the black dragon reach it, could destroy the world. Panzer Dragoon stands out as one of the most universally bad pieces of anime in existence. It's not even bad in a way that's interesting or amusing--just 20 mercifully short minutes of plot, characterization, and music barely suitable for a side-scrolling video game from the early '80s, filled with cheap, boring, mid-'90s vintage computer animated flight sequences. The two or three characters in it are reasonably attractive, and that's absolutely it. It'd be a real challenge to take 20 minutes and produce anything watchable given this concept and primitive computer animation to work with, but it doesn't look like the poor fools who made it even tried. Uniformly bad and boring, Panzer Dragoon is a video to avoid at all costs unless you want a very good tutorial in how not to make anime. When I first picked up Panzer Dragoon and noticed that it prominently featured early computer animation, I was a little wary, and the fact that it was produced by Sega didn't help much. Then again, the basic idea--fanciful airships and a guy and his dragon--sounds okay, and with a cool-sounding title like Panzer Dragoon (based on a well-regarded game series which I've never personally played), how bad could it be? Answer: Abysmal. To be blunt, Panzer Dragoon easily ranks among the worst anime I've seen, and I've seen some miserable crap. Let's start with the plot: There isn't one. It has about as much story as an '80s-era side-scrolling action game, and doesn't even have the excuse that it's based on one. Meet bad tower and cool airship captain. Now meet happy guys and blind girl. Now meet dragons. That took about 2 minutes, and all but two scenes from then on are of the ongoing dragon chase. It's kind of too bad, since the blind girl had the air of being a neat character. Given another, say, 12 episodes of a TV series (speaking of which, this is shorter than a single TV episode), maybe something interesting could have developed. Likewise, the uncomfortable partnership between the hero and the blue dragon could have been pretty interesting, given time to develop. Other than those three (who are basically the only characters in it anyway), there isn't much left to speak of. Now, in fairness to the poor fools who made Panzer Dragoon, it would've taken a heroic effort to develop much in the way of plot or character in 20 minutes. Then again, the only good thing about it is that it is, mercifully, over quickly. Visually, Panzer Dragoon is unusual, but in this early attempt at melding 3D computer animation with traditional cel-based art, the result is pretty ugly. The cel animation is simplistic and the integration of the two media is rough at best, and completely incongruent at worst. 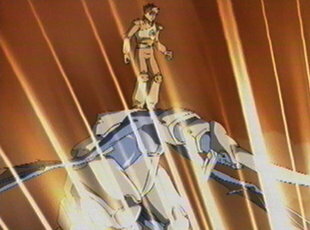 In some places, where the background in an action sequence is done as a computer model, it isn't too bad; the computer animation is primitive by modern (or even not-so-modern) standards, but it is passably mixed. In other scenes--most of those with airships for example--the age (mid '90s) and low budget of the animation really shows. Worst, though, are the computer-generated flight sequences, which make up most of the action and, therefore, most of the show. The intent, I assume, was to capture the feel of the original gameplay, which consisted of the dragon flying across terrain while you as the rider looked around and shot at stuff. In practice, it comes out looking like one of those early CG flythrough experiments from the '80s, which were passe even when this was new, and they haven't aged well. Past that, the human character designs are okay, and the dragons--courtesy the game--are interesting-looking. Unfortunately, they're awkwardly animated and their "breath" attacks look downright pathetic. There are a couple of dragon fights, but even those barely register on the coolness meter. Honestly, how can you manage to screw up a dragon fight? The last thing to cover in this litany of how not to make anime is the English dub (ADV never released a subtitled version), which is no better than the rest of it, and deserves to be singled out for its remarkably bad writing. The dialogue was, one assumes, supposed to be sort of archaic-sounding, but comes across as awkward, stilted, and just plain badly written. The acting is bad--hardly a surprise considering the bad writing/no story combo. The minor characters (all two of them) are badly acted. The hero, voiced by Randy Sparks, is particularly awkward (probably because he has more lines), but at least Sparks emotes pretty well. The dragon (Don'l Johnson) is kind of bland and sort of sanctimonious sounding, but his dialogue is mostly to blame there, too--somebody was (unsuccessfully) trying their best to sound deep. The only other character is the girl, and she's actually acted fairly well by Kim Sevier in all two lines she has. It made me wish even more that her character had been given time to develop (or even left onscreen for more than a minute and a half). The music, by Yoshitaka Azuma (who also scored the game), is--surprise, surprise--bad. It sounds like exactly what it is--a lame video game soundtrack--and there isn't even a vocal piece at the end. Summing up, this is bad anime at its worst. 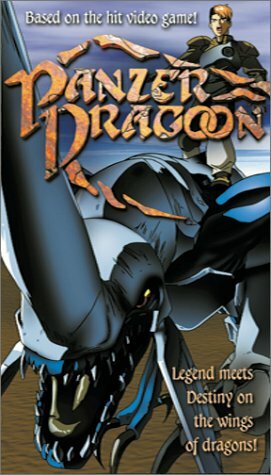 It has no plot, almost no characters, terrible dialogue, weak action, and a botched attempt at blending cel animation and primitive 3D computer stuff. The only saving grace of the whole thing is that it's over quickly. Don't waste your time--it's not even worth making fun of. Almost anything is better than this, but I'd try the Final Fantasy OAVs for something that is vaguely similar in setting and almost by definition much better (because it's impossible to be worse). Also check out Lensman for an even earlier and far more successful attempt at fusing cel art and computer animation. Of course, for an idea of what the combination of digital art and ink and acetate can do, anything by Gonzo (Blue Submarine No. 6, Yukikaze) or Ghibli's newer films (Princess Mononoke on) are a far better example. Based on the first game in the well-regarded video game series of the same name. The game in question was originally released in 1995 as a 3D rail shooter for the Sega Saturn and spawned a number of sequels. The anime adaptation has a similar, albeit even more simplified plot (with the addition of a girl to save), and most of the visual style and designs come from the game. Panzer Dragoon represents an early attempt at combining cel and computer animation in the same scenes, but is nowhere near the first anime to make use of CG. That honor goes to Lensman (released by Streamline long, long ago), which featured some space battle scenes done with 3D computer models. Despite being more than a decade older, Lensman's CG also looks better than Panzer Dragoon. Actually, this mess has one saving grace, but in a stroke of appropriate irony, it comes after the credits roll; the production sketches included after the feature are accompanied by a very nice little song. If you do happen to find this video in your hands, just fast-forward past the other 20 minutes of junk to get to it--it's the only thing on the whole tape that's worth watching anyway. None exists, and I can see why. Nothing much unsuitable for kids, and really young ones might be entertained by the pretty colors, but probaby deserves a 10-up on account of the violence. Violence: 2 - Some violence, but not a whole lot of blood. Language: 1 - Nothing much. Released by AD Vision on dubbed (only) VHS, long out of print. Amazon usually has a couple of used copies available, though they cost a lot more than you'd expect at last check: Panzer Dragoon (Dub) [VHS] . Panzer Dragoon is Copyright © Sega Any images are the property of their respective rightsholders, and included for review purposes only under the fair-use clause of US copyright law.